The MCR-840 offers superb audio performance via the small units of a micro component system. This was made possible by developing entirely new circuit designs, DVD Disc Player mechanism and many of the parts. Its advanced technologies include one-point earth, short signal routing, electronic volume control and Pure Direct. 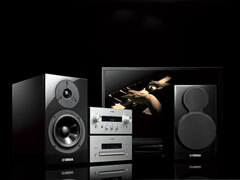 The speakers are also extremely high quality and feature Yamaha's elegant piano finish. In order to achieve truly high quality audio performance in a micro component, our technicians had to rethink circuit layouts and parts positioning, in effect compressing a full size receiver into a much smaller unit. They were able to achieve this with a design that features short signal paths, high thermal efficiency and excellent anti-noise and anti-vibration characteristics. Using discrete parts for all major components, this exceptionally high performance analogue amplifier delivers Yamaha's traditional high analogue sound quality. 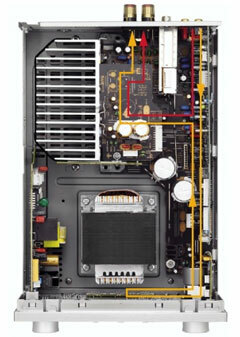 The aluminium-extruded heat sink is large enough to effectively dissipate heat. The R-840 employs an advanced electronic volume control circuit. 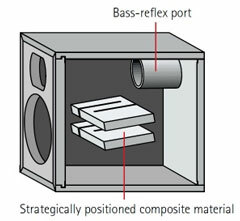 The audio analogue element does not transmit the audio signal, but instead is used in a rotary potentiometre, with the results processed through a microcomputer to the electronic volume. The benefits of this system are that it eliminates the static prone to occur found in analogue controls as well as gang error, and provides higher precision volume control. Rather than each section having its own earth, which can lower S/N ratio due to common impedance, the earth is located in one position, extending out to each section (power amp, power supply, preamp, motor drive and digital circuitry). In addition, signal paths are painstakingly laid out to be as short as possible, greatly reducing the chance of electromagnetic interference. 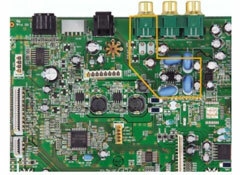 The image of R-840 interior view : Short signal path minimises interference and signal degradation. Red line is audio signal path. Yellow line is previous model's audio signal path. Many parts were custom-developed for this receiver, including the large, low-impedance transformer and large capacity block capacitors and resistors. 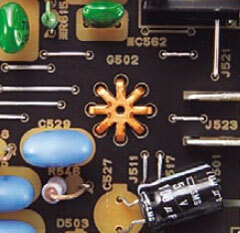 In addition, high-grade gold speaker terminals are used. Pure Direct results in the highest possible sound quality by turning off the display and causing the audio signal to bypass all non-essential circuits so it travels the shortest possible path from input to output. Pressing the button engages Pure Direct for both the receiver and DVD Player. receiver turns on and you can enjoy your music with enhanced power and clarity. A Play/Pause button is also provided. You can operate the iPod from the system remote, and the iPod charges while in use. It requires exceptionally high design expertise to achieve an internal parts layout and signal path that ensure the highest possible sound quality in the restricted space of a micro component. We realised this with a disc loader installed at the bottom of the chassis to minimise vibration and a high efficiency power supply. In some places components are linked directly rather than via wires, and where wires are used they are short and even thicker than those normally used, preventing the occurrence of electrical noise. Yellow area is an audio signal circuit. Rather than each section having its own earth, which can cause distortion due to common impedance, the earth is located in one position, extending out to each section (power supply, DAC, DVD module and digital circuitry). The DVD-840 uses a switching power supply that can deliver the high power that a top class DVD player requires. Switching power supplies can cause noise to be generated, so the power supply section includes dedicated circuits to eliminate noise emission. Yamaha chose the Burr-Brown PCM1753, an extremely high performance DAC. It uses advanced segment DAC architecture to achieve excellent dynamic performance and high tolerance to clock jitter. With this DAC, you hear the fine sound quality you expect from a highgrade component. As one of the world’s leading piano manufacturers, Yamaha has a long history of wood-working expertise. The NS-BP300 speakers feature the same luxurious and environmentally friendly finish as our fine grand pianos. No matter how good the music source, amplifier and speakers are, speaker cabinet vibration will affect the sound, usually for the worse. Simply adding internal reinforcements and conventional damping materials is ineffective. Yamaha solved the problem with VCCS, (Vibration Control Cabinet Structure) which uses strategically placed pieces of a composite material whose shapes, positions and angles were arrived at after a long process of experimentation. We also spent a great deal of effort finding a special foam rubber material that provides excellent vibration isolation performance. The NS-BP300 is unusual in having feet, which use high quality damping material to prevent external vibrations from affecting the sound and which also align the bottom with the other components for a neater design.